The film, which transpires between the events of Captain America: Civil War and Avengers: Infinity War, opens with Scott Lang (Paul Rudd) under house arrest. 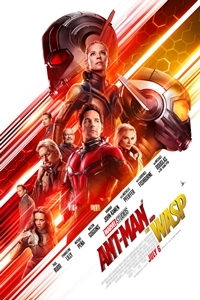 After he has a nightmare in which he appears to interact with the elder Wasp, Janet Van Dyen (Michelle Pfeiffer), who is trapped in the quantum realm, he contacts his former mentor, Hank Pym (Michael Douglas), and his former lover (and Janet and Hank's daughter), Hope (Evangeline Lilly). They engineer a "jailbreak" so Scott can work on a machine they're building to locate and free Janet but their efforts are impeded by two interlopers. The first is a fatuous black market tech dealer named Sonny Burch (Walton Goggins). The second is a young woman, Ava/Ghost (Hannah John-Kamen), whose phasing/disintegrating body needs an infusion of quantum energy to regenerate. Most of the movie is spent in overlong chases as the heroes lose, regain, and again lose their headquarters/laboratory, which has been miniaturized to the size of a piece of carry-on luggage. The most challenging thing about Ant-Man and the Wasp isn't figuring out all of the pseudo-scientific mumbo-jumbo regarding the so-called quantum realm (most of which makes no sense) but staving off boredom. Aside from the possibility of recovering Janet, the narrative has no point. The villains feel like they have been shoehorned in for little purpose beyond providing roadblocks to the climax. Although Ava has the potential to be a tragic figure (at least based on the backstory we're given), the character is neither well-developed nor effectively handled. Maybe that has something to do with the army of screenwriters. It's rare for anything coherent to emerge from the efforts of no fewer than five individuals. One quality that nearly every previous MCU movie has been able to claim is a high level of energy. Even those at the bottom of the barrel, including Iron Man 2, Avengers: Age of Ultron, The Incredible Hulk, and the first Ant-Man, have boasted it. It's largely missing in action from the feather-light Ant-Man and the Wasp, replaced by cute, comedic moments ("character-building" scenes featuring Scott and his daughter) and a lot of tedious running around as the characters attempt to reclaim the miniaturized factory from Ghost, Sonny, or both. Although Ant-Man isn't top-level Marvel fare, the cast is peppered with high profile names. As he did in the first movie, Paul Rudd captures the "everyman" spirit of the lead. Evangeline Lilly's increased role allows the Wasp to enter the growing stable of female superheroes although her chemistry with Rudd is fitful at best. Michael Douglas and Michelle Pfeiffer (who comic book fans will always remember as Catwoman) add some old-school star power to the proceedings. Laurence Fishburne has the somewhat thankless role of Dr. Bill Foster, Hank's former colleague and Ava's guardian. Hannah John-Kamen's tortured portrayal of the primary antagonist is one of the film's few compelling elements but it's undercut by the paucity of her third-act storyline. Walton Goggins is unfortunately impossible to take seriously. As is typical for a Marvel movie, the film offers a mid-credits sequence and one at the very end. The former is important not only from a standpoint of extending the main storyline but for helping to place Ant-Man and the Wasp more firmly in the MCU's overall context. The latter is short, uninspired, and a complete waste of time. It's there because fans stick around expecting something not because it's worth sitting through five minutes of names and a rather anonymous Christophe Beck score. Ant-Man and the Wasp tries to follow the pattern established by Black Panther of creating a standalone story within the larger MCU that doesn't rely on "guest appearances" by other superheroes. However, because of the unique nature of Wakanda and the Black Panther background, what worked in that case isn't effective here. Ant-Man lives in the "real" world and, despite frequent name-dropping, the absence of familiar characters stretches credulity, especially when one considers how game-changing Pym's shrinking technology is. There's also a sense that many of the new secondary characters have been included as a way of inserting individuals from the comic books into the movie. Whether they will resurface in other MCU productions remains to be seen. Although disappointing, Ant-Man and the Wasp is by no means unwatchable. This isn't the second coming of Batman and Robin. However, it's overlong and superfluous. What does it say when the best scene prior to the end credits is the Stan Lee cameo? Perhaps the issue is that, by setting the bar so high, Marvel has created a situation where it's a shock to the system to encounter a lesser film. Ant-Man and the Wasp feels like a made-for-Netflix movie that somehow found its way into theaters. I can recommend it primarily to MCU die-hards and completists. Others may find that, contrary to what the proverb asserts, it's not always good things that come in small packages.